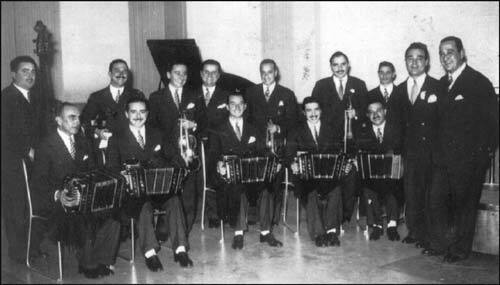 The turn for records came in 1937 with an unforgettable piece recorded for Odeón, containing the instrumental version of “Tierrita” tango by Agustín Bardi, and “A la luz del candil”, with music written by the talented Carlos Vicente Geroni Flores, cruel lyrics by Julio Navarrine, and sang by Carlos Ortega. But Tanturi’s great success would come in 1939 when he incorporated Alberto Castillo, a great attraction for the public. Castillo, with his perfect tune, master ability in the use of pitches and mezza voce, seduced the audience in many possible ways: with his exaggerated gestures, his masculine elegance and neat hair style, his gynecologist degree (obtained in 1942) and that sometimes intimate sometimes lively mood, all of which made a show of each and every tango. Continue reading.